Former And So I Watch You From Afar man Tony Wright is getting ready to release his first album as new project VerseChorusVerse (7 April), a record which will feature the song Unified Unity (Sing For Seeger). Wright hoped that one day the song would find its way to Pete Seeger. 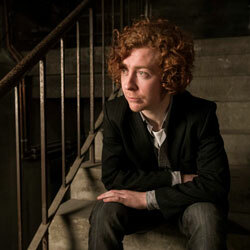 However following his death on Tuesday (28 January) Wright has chosen to debut the song early here on Q and pay his tribute to the folk legend's life in this guest column. 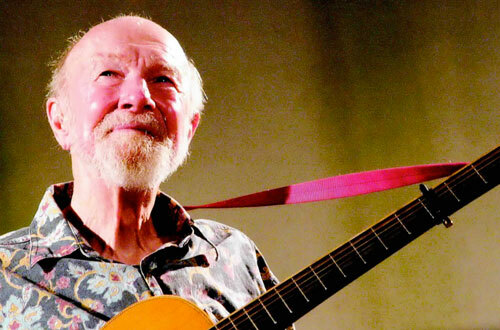 I awoke on Tuesday to the sad news that one of the true greats of the 20th century had passed away, the former Almanac and Weavers singer, the deservedly legendary Pete Seeger. It's hard, in the throes of the early 21st century, to appreciate and comprehend how towering an impact and influence this man and his music, his beliefs, his choices and ergo his lifestyle, have been. In a time where folk music is, seemingly, an unescapable soundtrack to a much more blatantly corporate world, here is a man who truly believed in the unifying power of music and the force for good it could do for humanity. You only have to listen to recordings of him leading a communal choir to hear the joy and hope burst forth. I can't help but listen to the live versions of some of his staple songs, like If I Had A Hammer, and just feel really damn good. I always, always, have to sing along. The sounds of those people just cutting loose in glorious unison, led by the charisma and enthusiasm of Pete Seeger, is something to behold and join in with. He, and others like Joan Baez, popularised the song that was to become the anthem of the Civil Rights movement in the 1960s, We Shall Overcome, notably in America but also here in my native Northern Ireland. My mother and her friends knew it well from rallies then and in 2006 when I heard Bruce Springsteen perform it in Belfast on his Seeger Sessions tour it was a deeply moving moment and one that will never leave me. Initially I only really knew of Pete Seeger from that song and hearing my mother, aunt and grandmother singing it when I was younger. After the Springsteen gig and album, I had to delve deeper, and to my surprise, I knew so many of his songs and the songs he popularised from his time as a TV and radio host, or from his field recordings of such near mythical performers like Leadbelly and Woody Guthrie. He was subpoenaed to testify before the US government at the House Of Un-American Activities in the 1950s when he was one of the most popular and famous musicians in the country. Can you imagine that now? The dude from The Script getting hauled in for covering a Crass tune? No, though I would love that... More recently, in his 90s, he occupied with the Occupy movement, leading them in song and in spirit. Incredible. After going further down this path of discovery and being truly inspired by the convictions of this remarkable man and his contemporaries, I looked around at the world at large, and felt the same risible frustration at the headlines I was reading and the ones I wasn't. I'd grown up as a huge fan of Fugazi, Public Enemy and The Clash so Seeger's artistic mirror rang very true and familiar to me. I wanted to write a song that had the pointed reflection of what was going on around us all, but without the angst that tends to accompany such things. I wanted to utilise what I had learned from Pete Seeger and turn it into a joyous rallying call, and the simple but powerful euphoria that singing with other people brings. I wanted to write something that perhaps one day would make its way to Mr Seeger, and maybe, just maybe, get to sing it with him. For more head to Facebook.com/VerseChorusVerseVCV.